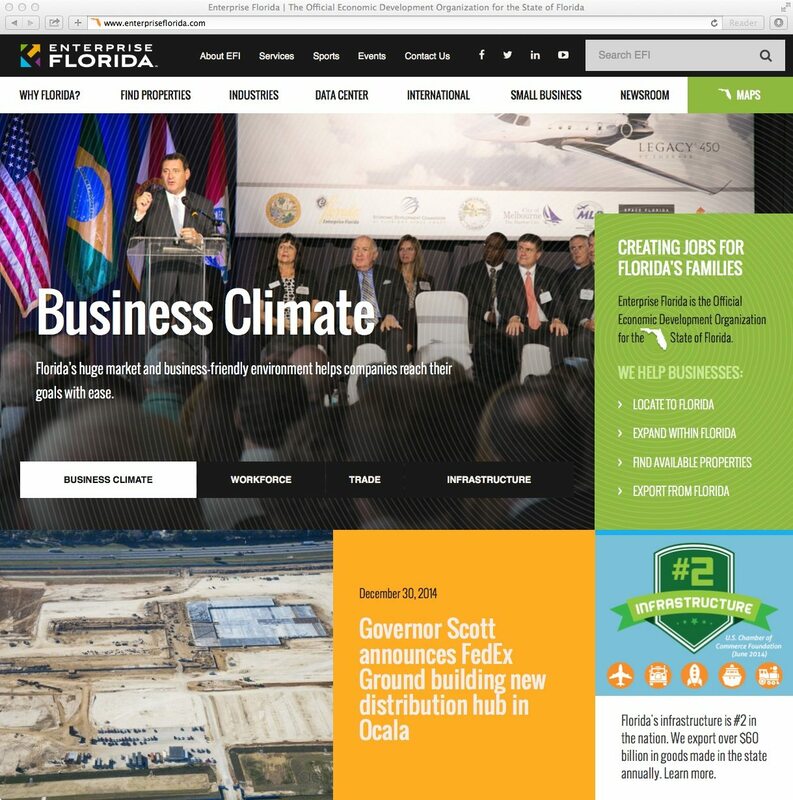 Enterprise Florida Inc. (EFI) is the principal economic development organization for the entire state of Florida. A major resource for companies of all sizes, EFI plays a key role in convincing companies to locate and expand in the state, creating thousands of new jobs and investing billions in capital from the Keys to the Panhandle. If you’re a business looking to relocate to, expand within or export from Florida, you call EFI. But until 2013, the EFI website was a bit outdated and unreflective of EFI’s important position. If you’re going to be the lead economic development agency for the state of Florida, you’d better look like it. An information powerhouse, the EFI website had hundreds of pages of useful content. Unfortunately, most of it was buried under convoluted site navigation, so few users were actually taking advantage of EFI’s rich resources. In short, the site’s structure and design was not living up to the potential of its content. 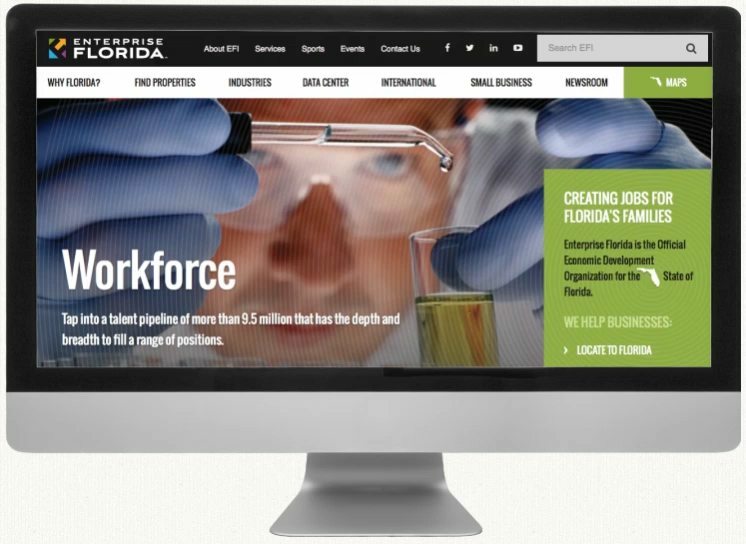 Enterprise Florida had a clear, powerful message, but that message was undermined by an out-of-date visual identity. We were going to change that. This was a tear it down and rebuild situation. One content audit, one brand platform, six user personas and several wireframes later, we landed on a user interface design that made the EFI website stand out as an all-purpose tool—not just a marketing one. That’s how one EFI stakeholder compared the new website to its antiquated predecessor. It was interactive. Visually impactful. Responsive and easy to use. Most importantly, EFI now had a clear and convincing ally in its mission to answer“Why Florida?” for business owners and site selectors around the world. As our website project continued along, we had to deal with the elephant in the room. The elephant that insisted on sitting on every piece of paper, website and ad that EFI touched. Unanimously, we decided that the old logo had to go. Anchored by our brand platform, we distilled EFI’s “thrive in Florida” message into a vibrant mark that invokes a sense of progress and momentum wherever it appears. Goodbye, visual disconnect. Hello, cohesive brand. After some extensive content excavation and design renovations, EFI now has a fresh look and a compelling website that works for instead of against them. Backed by their new polished image, the agency clearly stands out as a modern and forward-thinking economic development force.